The Musandam Peninsula is located on the northern border of the Sultanate of Oman which extends into the Strait of Hormuz, a narrow channel into the Persian Gulf from the point of the Arabian Peninsula. Although politically part of Oman, the Musandam Peninsula is separated by the east coast of the United Arab Emirates. Tagged as the “Norway of Arabia,” the Musandam Peninsula is noted for its amazing rocky inlets called khors, small villages and roads that cut across the mountains. These khors, also referred to as fjords are just 60 km wide and do not exceed 60 m in depth but they are very valuable trade routes since 90% of the Gulf’s oil passes through this area. The natural beauty of Musandam is best explored by sea through boat or traditional ships. 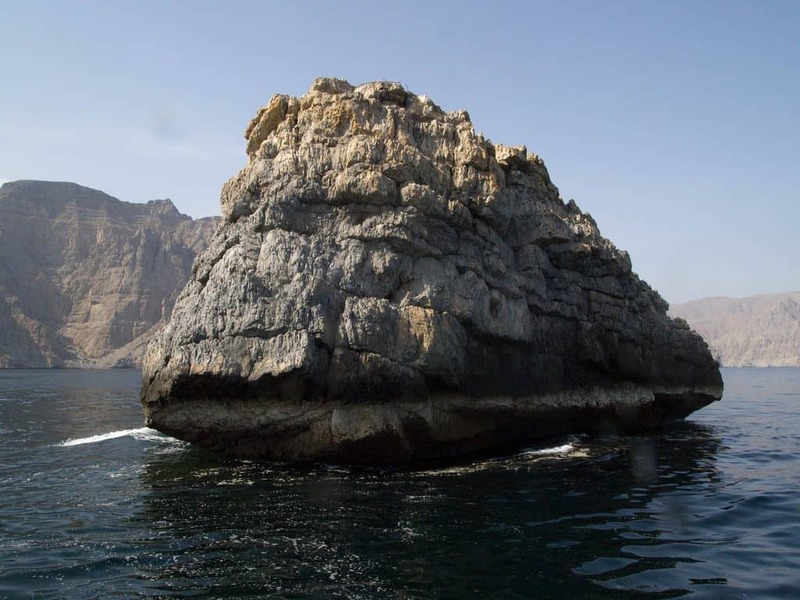 Many visitors journey to Musandam to view incredible geological sites and explore the vast marine life in the gentle waters that lie beneath the massive limestone cliffs. The Strait of Hormuz carries nutrient-filled waters from the Indian Ocean into the gulf which is the reason behind its rich biodiversity. 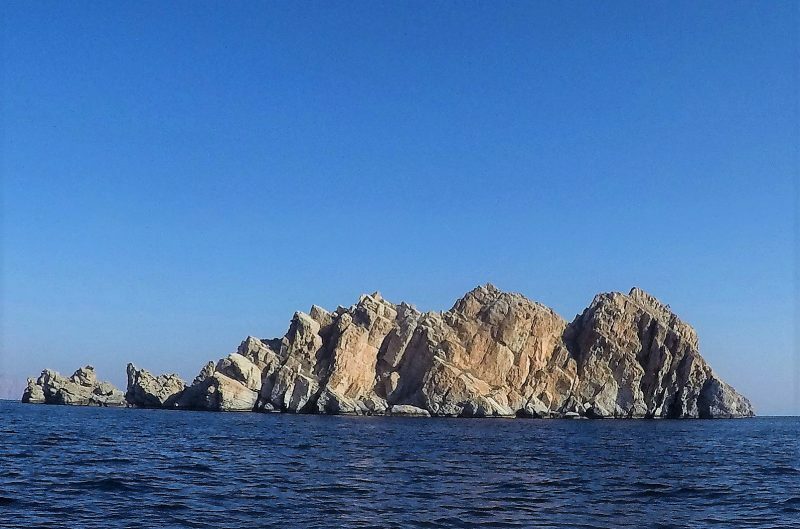 Musandam offers excellent year-round diving with visibility ranging up to 30 m and temperatures between 21-30ºC. The period from November to April is quite cold and sometimes there is plenty of jellyfish so it’s advisable to wear a full wetsuit, hood, gloves, and booties for extra protection. The Diving Trip in Musandam opens a window of opportunity for advanced divers to see a kaleidoscope of coral reefs inhabited by a variety of fish, rays, turtles, morays, and barracuda. Dolphins also find their way to these calm waters and they are often spotted swimming alongside dive boats. Between May to October, the waters of Musandam attract whale sharks, the biggest fish in the ocean because of the rich plankton. During this period, the gentle giants of the sea enjoy a smorgasbord before taking off again to continue their journey. The Musandam Peninsula is an underwater realm of beauty that dazzles divers from all parts of the world. Here are just some of the few interesting dive sites in the region worth exploring. Descending in the waters of Musandam doesn’t just give you a spectacular view of colorful coral reefs and gardens but it also has underwater caverns that have been eroded through the limestone rock by the sea. You can begin exploring the underwater caverns at 60 m from the exit point at Ras Sannat or you have the option to go 500 m from the rock stack at Khor Mala. The main chamber is around 15 to 20 m into the rock with a maximum depth of 10 m.
The caves are home to a variety of fish, cleaner shrimps, stingrays, and resting sharks often found on the sandy bottom. At night, turtles seek the shelter of the caves to rest and stay away from the prying eyes of predators. Another point of interest is the Lima Rock which is a small island composed of shallow caves and deep fissures. There are two sites; one is located on the north side of the rock while the other lies on the south. There are varying maximum depths depending on the area which is anywhere between 12 – 60 m. At the southern side of the island at depths between 12 – 20 m, you’ll find a variety of hard corals, patches of orange and pink soft corals, and large shoals of reef fish. 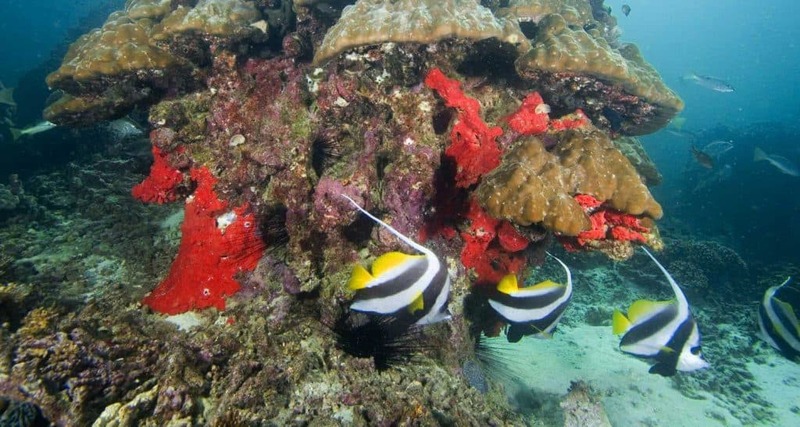 If you venture 20 m and deeper, you’ll be able to see yellow, green, black, and purple coral. At this depth, you are likely to encounter yellow-mouth morays, white tip sharks, leopard sharks, and different types of rays. If you’re into macro photography, you can check out the colorful nudibranchs at the northern side of the island. The Ras Lima headland offers two good dive sites namely the north-facing site in Lima Bay and the east bay just south of the headland. The north side features an exciting wall dive with a steep cliff that plunges to 10 – 15 m while the east bay has headland cliffs that plummet into the water at depths ranging from 6 – 8 m. This site is known for large boulder corals (fallen boulders covered in corals) that harbor small reef fish like the triggerfish, pelagic fish, seahorses, and occasional devil rays. The waters around this almost round rock formation attract different kinds of reef fish, tuna, trevally, barracuda, and occasional leopard sharks. Feast your eyes on the colorful corals where tiny marine creatures like fan worms and feather stars live. That’s not all; if you pay close attention to the sandy bottom, chances are you’ll spot resting stingrays. The best thing about Octopus Rock is that it can be visited in most weather and tidal conditions because of its protected location in Lima Bay. This island, located between Habellyn and Shaboos bays, features several slopes of wall and table corals at 5 – 10 m. Common marine sightings include angelfish, fusiliers, giant trevally, stingrays, manta rays, batfish, and turtles. If you want to maximize your visit to the Musandam Peninsula, you can go on an Overnight Musandam Trip in a traditional Omani boat so you can visit multiple diving sites and immerse yourself in the region’s rich biodiversity and unique ecosystem.